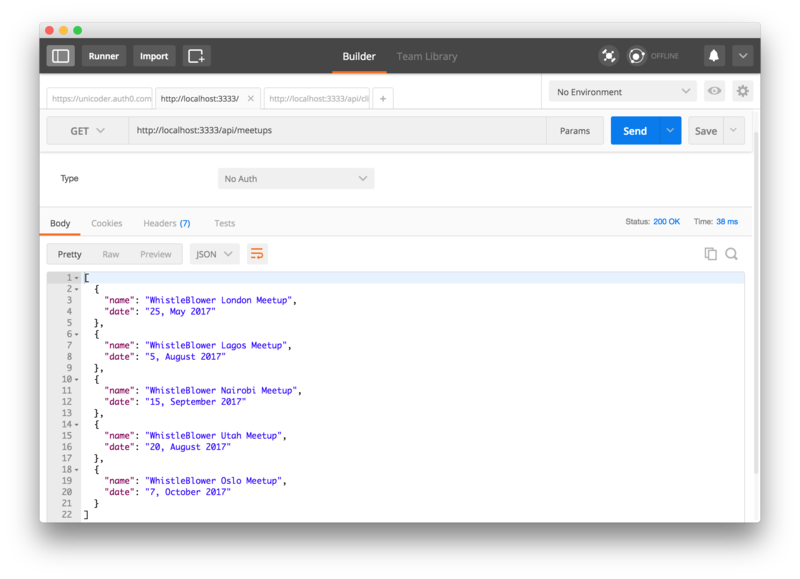 In this article, we'll show you how to create a neat little web app that runs on the EmberJS framework and uses an API built on Node.js. Read on for more! EmberJS was developed by Yehuda Katz. It was initially released in December 2011. EmberJS was also formerly known as SproutCore MVC framework. New applications now run on EmberJS 2 which was released in August 2015. EmberJS 2.0 introduced new APIs and removed deprecated ones from Ember 1. The goal of Ember 2 is to remove badly designed and unnecessarily complicated code from Ember 1. And apps that run on Ember 1.13 without any deprecation warnings should run without issues on Ember 2.0. Currently, many popular products use EmberJS to build their user interfaces. Such platforms include LinkedIn, Yahoo, Zendesk, Square, PlayStation Now, Apple Music, Heroku Dashboard, Twitch, Discourse, IndieHackers and more. There is a comprehensive list of projects using Emberjs on builtwithember.io. 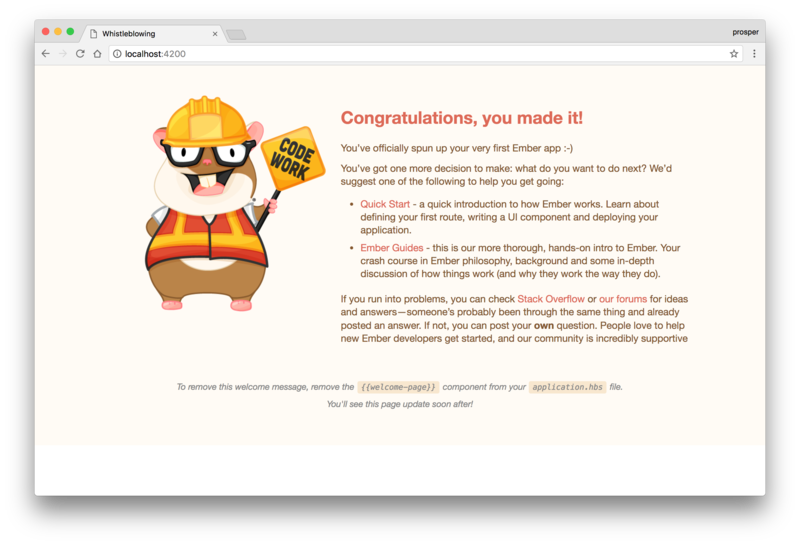 EmberJS documentation is very detailed, and there is a vibrant community of users. If you have experience with frameworks like VueJS, Angular, and React, then you'll understand how EmberJS works in a split second. Developers coming from the jQuery world might find it difficult to comprehend at first glance. But if you are familiar with frameworks like Laravel and Rails, then you'll discover a pattern that'll make fall in love with EmberJS. Let's take a good look at how a typical EmberJS app works. Our fictitious app is a Student Management System and the URL is https://studember.ng. One of the URLs in this app is https://studember.ng/students. This route simply returns the details of all the students registered on this app. Now, check out what happens when the user loads the app for the first time. Ember router maps the URL to a route handler. The route handler then renders a template and loads a model that is available to the template. This creates a route file at app/routes/route-name.js, a template for the route at app/templates/route-name.hbs, and a unit test file at tests/unit/routes/route-name-test.js. It also adds the route to the router. The template extension is .hbs. Models are objects that represent the underlying data that your application presents to the user. The structure and scope of your app will determine the types and number of models that will present in it. Our student management app might have a Student model to represent a particular student. Models are also used to persist data. Typically, most models fetch and persist data to a store. The store could be a database on a server or simply a JSON file. Ember Data gives you a single store that is the central repository of models in your application. Components and routes can ask the store for models, and the store is responsible for knowing how to fetch them. Ember provides some methods that are triggered at various points from creating a component up until the component is destroyed. This is called the Component's Lifecycle. You can declare methods to hook into the component's lifecycle to control the behavior of components in your app. This creates a component file at app/components/student-list.js, a template for the component at app/templates/components/student-list.hbs, and an integration test file at tests/integration/components/student-list-test.js. Ember Controllers are routable objects meant to decorate a model with display logic. They sit between the template and model to deal with logic and properties that do not belong to the view or the model. This creates a controller file at app/controllers/students.js, and a unit test file at tests/unit/controllers/students-test.js. Next, let's build an application with Emberjs 2. It gives information about whistle blowing activities in your region. It's a small community of whistle blowers. A guest user on the Whistle Blower app will only have access to basic information about the whistle blowing activities on the landing page. An authenticated user will have access to whistle blowers and their profiles. An authenticated user will have access to whistle blower meetups/gatherings. An endpoint to serve the latest whistle blowing activities around the world - /api/activities. An endpoint to serve whistle blowers and their profiles - /api/whistleblowers. An endpoint to serve whistle blower meetups - /api/meetups. Securing the endpoint that serves whistle blowers profiles and meetups, so that it can only be accessed by registered users. Go ahead and fetch the Node.js backend from GitHub. Check out the full server.js file here. Note: Make sure you have nodemon installed globally. The public whistle blowing activities endpoint should be http://localhost:3333/api/activities. The private meet up endpoint should be http://localhost:3333/api/meetups. The private whistle blower endpoint should be http://localhost:3333/api/whistleblowers. Don't worry about the middleware in charge of securing our endpoint for now. We'll deal with that later. Now, let's build our frontend with EmberJS 2. EmberJS has a very nice tool for scaffolding your apps. It's called the ember-cli. It's being maintained by the Ember team. 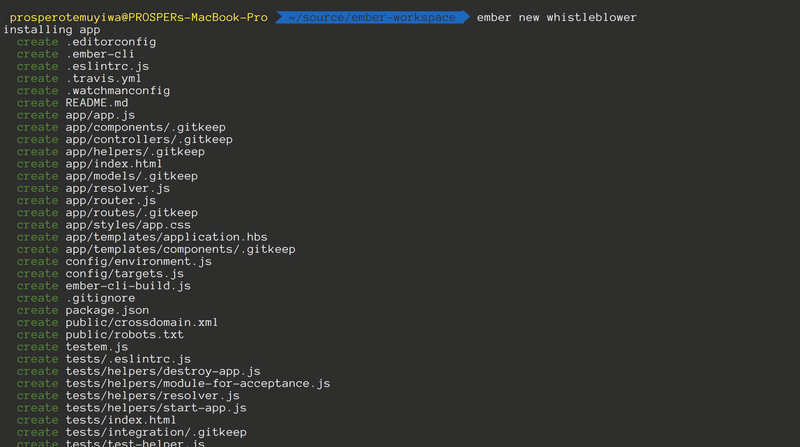 Move into the new directory, whistleblower and run ember serve to start up your app. Let's check out the structure of our newly scaffolded app. Note: We are not writing any tests for this application. It's out of the scope of this tutorial. Now, our app will show a blank screen. Sweet! Let's get started. 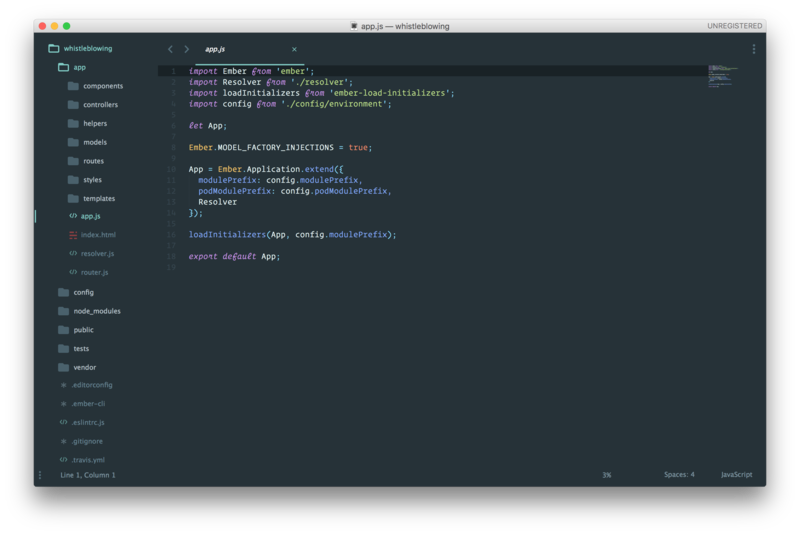 Ember already provides a directory and a stylesheet file for your custom CSS. So, open app/styles/app.css and add the CSS here. That's all about our styling. Next, let's create our routes. 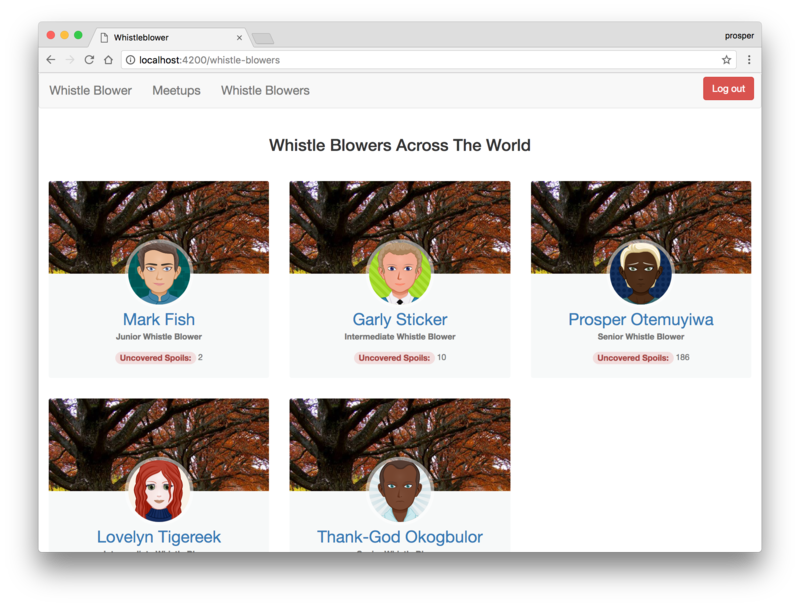 provides details about whistle blower meetups. 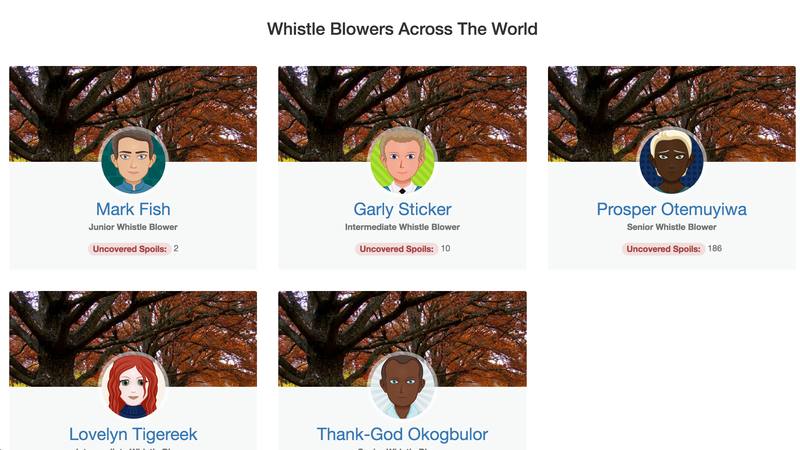 provides details about whistle blowers. The route files are generated together with their respective template files. The EmberJS route handler renders a template when a route is invoked. Now, next, we need to create a utility file for authentication and fetching API data for our routes from the backend. Well, Ember allows us to create utilities, but this is better suited for services. An Ember service is a long lived Ember object that can be made available in different parts of your application. This is exactly what we need. Our auth service contains different functions for authenticating using Auth0 hosted lock, saving/extracting tokens, checking expiry date, and checking if a user is logged in or not. Note: You can fetch a property in a service using the this.get('<name-of-property>') syntax. And append npm to the module name like we did in the code snippet for the auth service above. Here, we fetched the meetups, whistleblowers, and activities from the API. Ember already provides jQuery by default. So, an alternative is to use Ember.$.get(url) instead of axios. I personally love using axios, hence the reason I chose to use it here. Ember Services are injectable. You can inject them into different parts of your application as the need arises. We created our routes earlier. Now, we need to pass data to the templates of these routes. Once a user hits a URL, they should be able to get data presented to them. Ember provides a model method in routes that allows us to fetch data and pass it down to the route template. So, we'll add the model method into our routes, inject the API service and call the service methods to provide data to the model hook so that it can be passed down to the templates. Now, we need to create a route for our index page, which is the landing page. Next, we need to display data in their respective templates. We imported the app-nav component into this template to provide navigation menu for our app. We also looped through the model data coming from the index route using the #each helper method.